what St. Augustine called "the twin sacraments". BAPTISM The Matthean gospel closes with the command "to go out into the world, baptising in the name of the Father, Son and Holy Spirit." That is how it was probably being done towards the end of the first century A.D. In the Acts of the Apostles there are examples of baptism being the initiation rite to become a follower of Jesus. Probably at first the baptised professed a belief in Jesus as perhaps illustrated by the man born blind in the Johannine Gospel - "Lord I believe." or as in Acts in "the Lord Jesus". By the end of the 4th century it was mainly adults who were baptised after a vigorous initiating programme as illustrated in the catechetical lectures by Cyril of Jerusalem. In the first couple of centuries baptism probably varied in different regions. Some were anointed with oil in pre-baptism. At first it would seem that the washing in flowing water, and the importance of water as a birth symbol and following the example of Jesus' baptism was important. Later Paul's teaching also contributed to the meaning of baptism as in Romans Ch. 6, vv. 3-5, "We have been baptised into His death, ... buried with him through Baptism into his death, that in order as Christ was raised from the dead through the glory of the Father, so we too might walk in newness of life." After the ascension pf Christ, even though our Lord gave no instruction about organisation for His followers it would seem baptism was chosen to be the sign for being part of a community believing in His teachings as illustrated in ACTS. Once Christianity became the official religion of the Roman Empire under Theodosius in A.D. 381 children's baptisms became commonplace. MEANING OF BAPTISM Before my baptism I am simply a child of natural grace, not spiritual, endowed with reason but also a child of the flesh. Holy water poured over one in baptism three times in the name of the Trinity cleanses and makes one a child of grace. It is called REGENERATION, meaning new birth. Unless one is born of Spirit, one cannot enter the kingdom of God, Jesus told Nicodemus. BAPTISM comes from the Greek word meaning "IMMERSION'..The water in the font is sanctified or blessed by invoking the Holy Spirit before the child is immersed in it. Water has always been seen as the source and symbol of life. The child is also anointed with holy chrism, perfumed oil consecrated by the bishop in Holy Week, signifying the gift of the Holy Spirit to the child. In theOrthodox Church this anointing is seen as Confirmation. The child after baptism is dressed in a white robe to signify his/her new life in Christ. The Godparents are handed a candle to signify that the neophyte, that is, the newly baptised, has been enlightened by Christ who is the light of the world. 1.THE CHILD OF GOD.. This means that the "old person" has been put away and in the new Adam, Jesus Christ I am from henceforth God's special child of grace sealed with the Cross. I have been filled with the Spirit to transform my life. So I live in such a way that the Holy Spirit will always work through me. 2. A MEMBER OF CHRIST This means that I am henceforth a member of the Church, which is Christ's body, and part of the whole Christian community - i.e. the church here on earth (the militant church; the church in paradise, i.e. the expectant church; and the church in heaven, i.e. the triumphant church). As a member I support each other by my prayers and loving care for others. 3. AN INHERITOR OF THE KINGDOM OF HEAVEN This means as I have been ingrafted into Christ's death and resurrection I have become an heir to God's heaven. However I have to live by the precepts Christ has taught. [To know the "rules" for this kingdom read St. Matthew's gospel chs. 5-7 which is often referred to as The Sermon on the Mount]. Once baptised I can never be baptised again. If I lapse from the Church the way back is through the sacrament of Confession or Reconciliation as it generally called to-day. If I am baptised as an infant my Godparents assume this commitment for me until I am old enough to shoulder it myself. But if I am baptised at a reasonable age I make this commitment myself.There are three commitments made. 1. To fight against Satan and all his works. This means that I recognise the presence of evil spirits at work in this world, however very subtley, and that by God's grace I shall fight against all evil. 2. To believe the articles of Faith set out in the Apostle's Creed. 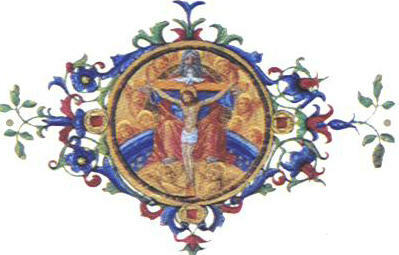 This briefly means that I believe that God is a Trinitarian God, Father Son and Holy Spirit, all working co-equally in creation, redemption and sanctification, that the second person became incarnate in order to restore mankind to his former glory and as a consequence died for the sin of mankind, and conquered death, the penalty for sin, by His resurrection, and then sent the Holy Spirit to be our Guide and Comforter. This creed also sets out the belief in the Holy Catholic and Apostolic Church and in the belief of the forgiveness of sins and of the life to come. 3. To keep God's holy will and commandments all our days. This means that I should always act as Christ would. These are summed up in the two great commandments: to love God and to love my neighbour. To do this I need access to God's grace through the Sacraments, prayer and meditating quietly, especially on the Scriptures and other holy writings. .
All this is possible as God is always with us, as He lives within us in every situation and at every moment. We only have to trust and believe. Hope and perseverance are the two great Christian virtues after love.and will bring us to eternal life in Christ. But never forget you have been made a new person, a person of grace living in the kingdom of God. By trying to live like that with God's help we are imitating our Creator and our God who demands that we are holy as HE is. A Catechism sets out the basic teachings we should believe to be a Catholic Christian and other facts which are helpful in knowing more about our faith and the church.